Frail bones are a serious problem for seniors. Bone weakness increases the risk of fractures, which could be debilitating and contribute to a slew of other health consequences. It’s important to recognize the signs of weak bones and know what to do in order to prevent long-lasting problems. Below are 6 signs of weak bones you should pay attention for, and simple solutions to help improve your bone health. If you’ve experienced two or more fractures within the past two years, or the cause of your bone fractures has been unusual, that can warrant weak bones. 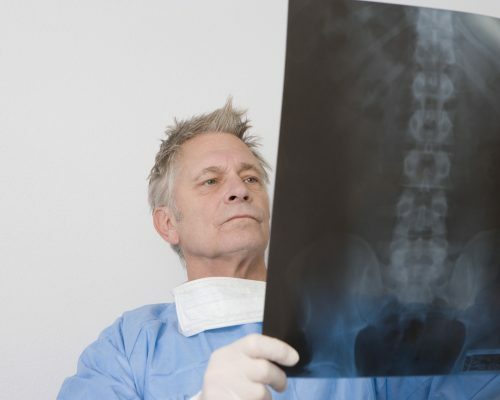 To determine if your bones are actually weak, speak with your doctor about scheduling a bone density test, which is a specialized X-ray that measures calcium and other bone-supporting minerals. Being petite has its benefits but, unfortunately, it won’t help your bones. Being naturally thin or small-framed can put you at risk for weak bones. Individuals who are thinner or smaller tend to develop osteoporosis years earlier than someone who is larger. Alas, there isn’t much you can do about the body you have, but take it as a precaution that you require more exercise and a bone-friendly diet in order to prevent or slow down bone loss over the years. Speak to your doctor about calcium and vitamin D supplementation as well. Unfortunately, the medications you use for your autoimmune disease – specifically, corticosteroids – could be weakening your bones. Long-time use of cortisone and other corticosteroids contribute to the loss of essential bone minerals which are leaking out of the bones. If you must treat an autoimmune disorder, then you have to remain on the medications. Your doctor, though, should keep a close eye on your bone health to ensure your bones do not become frail in the process. They may be able to offer intervention tips to keep your bones strong during your treatment. Smoking, drinking alcohol, not consuming calcium, and having a previous eating disorder can all contribute to weak bones in later life. These habits diminish bone-strengthening nutrients, thus leaving the bones weak. If you currently smoke, quit. If you consume more than two alcoholic beverages a day, cut back. And if you’ve had a previous eating disorder, your doctor can recommend treatments in order to strengthen your bones. If you have a first- or second-degree relative who developed osteoporosis prior to the age of 50 or menopause, then your risk of osteoporosis is higher, meaning you should begin protecting your bones much earlier. Letting your doctor know about your family history can alert them to start testing earlier, as well as to prescribe treatment options in order to preserve bone health sooner rather than later. If you’re a woman with irregular or infrequent periods, this could be an early sign of bone weakness. Missed or irregular periods are a sign of low estrogen, which also contributes to weakening bones. There are numerous reasons for low estrogen, such as polycystic ovarian syndrome (PCOS), over-exercising, and an eating disorder, to name a few. Your doctor will be able to diagnose the cause of your low estrogen and recommend treatments in order to boost it. This, in turn, can help strengthen bones. These are just some of the signs to look out for when determining bone health. Weak bones can be prevented, it’s just a matter of spotting the signs early on.